We have piled monolithic stones together on hills, built tombs and houses, pyramids and castles. We have altered waterways, cleared woodland and tunnelled underground. In the 21st century our footprint has become an increasingly critical political, ethical and environmental matter that impacts almost all areas of life. Pressing questions posed by the growing awareness of our place in the natural world have impacted design and architecture. How do we build houses and work places that are in harmony with the natural world? How do we plan cities and new towns so that they are more efficient and better designed? This is not just a question of making sustainable, eco-friendly buildings that have low energy demands and can heat and cool themselves ‘naturally’. There is a broader, more philosophical question that takes into account the surrounding landscape: how do we design and build places that do not intrude upon nature, but rather exist as an extension of it? Such a question has deep practical ramifications as it problematizes old paradigms like ‘inside’ and ‘outside’, ‘human-made’ and ‘natural’. So many of the environments we build new structures in are ‘human-made.’ By necessity, the vast majority of construction occurs in areas where humans already dwell in significant numbers, however, technological innovations such as the internet and a growing acknowledgment that it is good for humans to spend more time in nature have led to innovative designs in spaces where such work has rarely been seen. 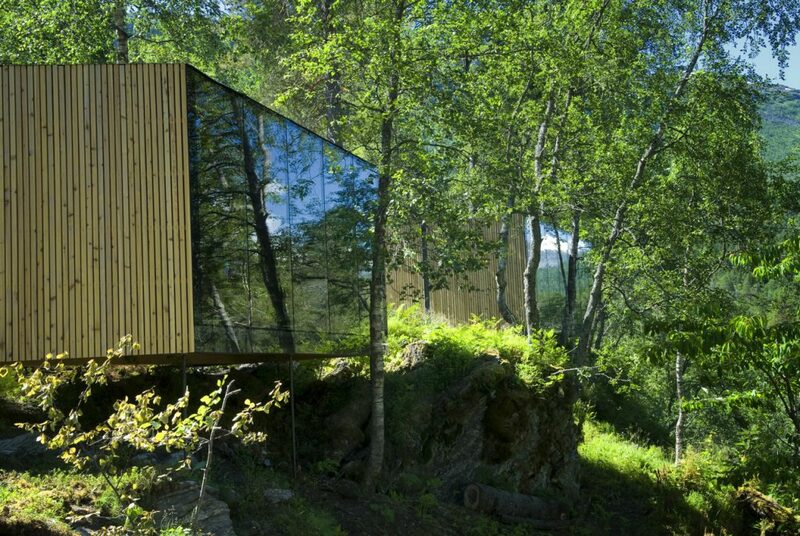 One example of this can be found in the first ‘landscape hotel’ in Europe: Juvet Landscape Hotel in the Valldalen valley in north western Norway. The problem inherent in traditional architecture is that destruction so often necessarily precedes the construction of a new building. The architects of Juvet Landscape Hotel, Jensen and Skodvin, have sought to build a dwelling that circumvents this usual practice by focusing on conserving the landscape instead of destroying it. The principle that conservation of topography is just as important an aspect of sustainability as energy consumption has guided their design. Such a principle can admittedly be rather restricting: in the case of Juvet Landscape Hotel permission was granted for a maximum of 28 buildings due to an embargo on rock blasting and other forms of significant alteration to the land. However, such a philosophy is ultimately rewarding: the underlying design principle of conservation has opened up the opportunity to build a hotel in a place where no structure was previously allowed: Jensen and Skodvins’ commitment to conservation has allowed for the building of a hotel in a nature reserve. What’s more, the restrictions have inspired the design rather than hindered it, creating a series of structures that are just as magnificent as the surrounding landscape they reside in. Due to the accommodation of the buildings to the topography of the site, no two rooms are alike. 28 bungalows exist separately from one another, built around the trees and other landscape details so as to impose as little as possible on the environment. Jensen and Skodvin have achieved a remarkable feat: they have created rooms that feel as boundless as the valley outside. Every bungalow has at least one wall entirely built of glass, however there is an immediacy to the landscape not explicable or reducible to the mere use of large ‘windows’. Privacy has been achieved through clever use of angles, so that no two rooms look onto one another: all have an unimpeded view of the breathtaking landscape of the nature reserve. The design principles and careful placement of each bungalow have not only resulted in the production of a world-class example of conservation-influenced design, they have enabled a series of truly remarkable ‘enclosed’ spaces that project an illusion of openness far beyond what could have been expected. 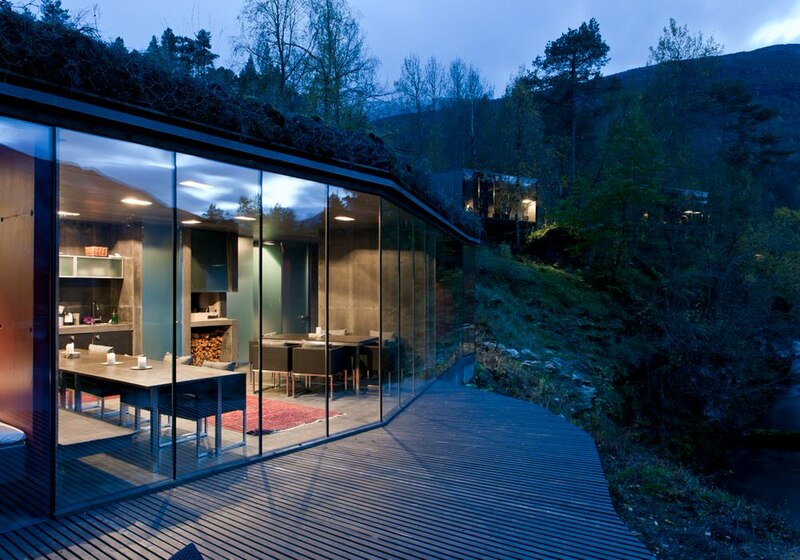 Not only have Jensen and Skodvin designed a series of buildings which have barely impacted the natural landscape, they have achieved the incredible: they have designed a hotel which draws so little attention to itself that once inside, the human-made structures themselves recede into the background, leaving the visitor entirely alone in the beautiful landscape of Valldalen Valley. If you would like to discuss how your future building project, call us today.